Sassy City Chicks is coming to Chicago (TONIGHT!). What makes this event special? It's not JUST shopping! You'll be sipping cocktails, delighting in (amazing) spa services, and of course take home an uber luxe swag bag with an upgrade ticket. You don't want to miss out on these, as Sassy City is notorious for these for their goodies. ChiIL Mama Readers get FREE admission using the code GEN AD when "purchasing" a General Admission ticket, or upgrade for a sweet swag bag. Click here to order your tickets. 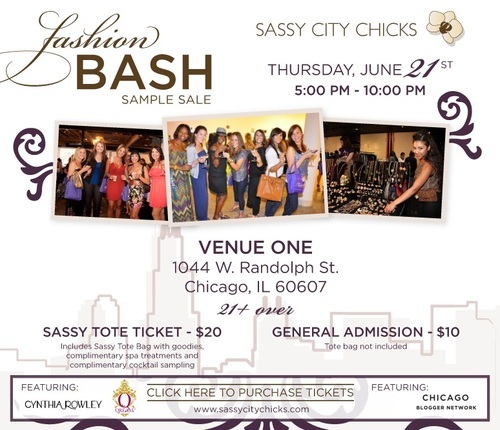 Chi City fashionistas: looking for a ladies' night out? Step out in style with the Sassy City Chicks! Our Spring Fashion Bash, hosted at Venue One, will feature discounted apparel & accessories, FREE spa treatments, and sassy swag! Food/Alcohol: Cocktail sampling will be offered. No food available at this event. AGE REQUIREMENT: YOU MUST BE 21 + to attend. No exceptions.